On the evening of the first Thursday of every month, all the galleries in Spitalfields and the entire East End throw open their doors. There is an infectious sense of carnival as people parade from gallery to gallery catching up on the contemporary art scene and collecting as many free beers as possible. 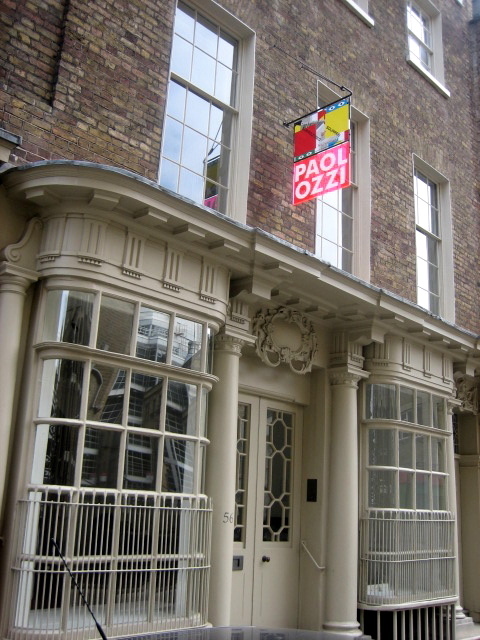 I recommend a trip to Raven Row (a new gallery comprising two beautifully restored eighteenth century houses in Artillery Lane) which is opening Eduardo Paolozzi : The Jet Age Compendium tonight. I’m away fom the Spit these days but my first studio was in Brune Street and I’d walk past this most days. I was and am still very fond of it. Gather it’s one the very oldest/rarest surviving shop fronts in London, indeed Europe even… I gather. It was painted a fine and sturdy dark green back then (’82-83-84) which I might prefer. Tho’ conversely, I recall little sunlight made it into Raven Row so let’s cheer on the beige.